New York, United States, 2013-12-05 — /travelprnews.com/ — In the third quarter (Q3) 2013, online channels which include Online Travel Agents (OTAs) and hotel websites (Brand.com) continued to experience the most growth in hotel bookings, according to data from the TravelClick North American Distribution Review (NADR; Fourth Quarter 2013). The NADR aggregates hotel bookings by channel for the transient segment (individual leisure and business travelers). The OTA channel experienced the largest jump in bookings, with a 13.6 percent increase in the third quarter compared to last year. Brand.com, increased year-over-year by 5.3 percent. The GDS (Global Distribution System, used by travel agents) grew 3.7 percent. Hotel Direct (calls right to the property and walk-in customers) remained flat (-0.2 percent) and calls to a hotel’s 800-number, the CRO channel, decreased -5.5 percent. Average daily rates (ADR) in Q3 across all channels grew 3.6 percent compared to last year. The OTA channel had the highest ADR growth with an increase of 8.0 percent. Additional channels that showed growth include: Hotel Direct, up 4.1 percent; GDS up 2.5 percent; CRO up by 3.8 percent and Brand.com up 2.5 percent. In Q4, OTA ADR is currently tracking ahead by 7.1 percent. ADR for the fourth quarter is also growing for the other channels, up 2.4 percent for the CRO channel, 5.6 percent for the hotel direct channel, 2.6 percent for the GDS channel, and 1.7 percent for Brand.com. 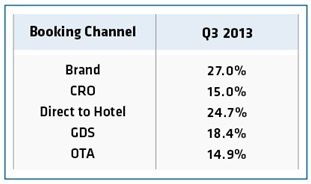 The chart illustrates the cities that receive the most share of bookings broken out by channel. TravelClick (TravelClick.com) provides innovative cloud-based solutions for hotels around the globe to grow their revenue reduce costs and improve performance. TravelClick offers hotels world-class reservation solutions, business intelligence products and comprehensive media and marketing solutions to help hotels grow their business. With local experts around the globe, we help more than 36,000 hotel clients in over 160 countries drive profitable room reservations through better revenue management decisions, proven reservation technology and innovative marketing. Since 1999, TravelClick has helped hotels leverage the web to effectively navigate the complex global distribution landscape. TravelClick has offices in New York, Atlanta, Philadelphia, Chicago, Barcelona, Dubai, Hong Kong, Houston, Melbourne, Orlando, Shanghai, Singapore and Tokyo. Follow us on twitter.com/TravelClick and facebook.com/TravelClick. This entry was posted in Hospitality, Hotels, Luxury, Resorts, SPAs & Wellness, Travel Management, Travel Marketing and tagged average daily rates, bookings, Business Travelers, hotel bookings, hotels, leisure travelers, North American Distribution Review, TravelClick. Bookmark the permalink.